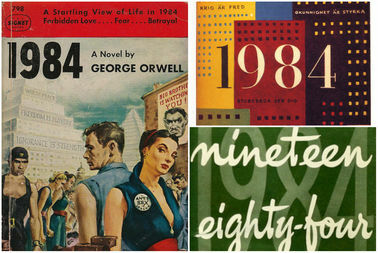 Three covers printed for George Orwell's dystopian novel "1984." It's not just Amazon customers clamoring for George Orwell's "1984." The acclaimed dystopian novel that describes life in a totalitarian state sat at the top of the online retailer's bestselling book list as of Friday afternoon, having peaked Wednesday morning — and it's also topping the list at all three library systems in New York City. The spike in the novel's popularity comes days after senior advisor Kellyanne Conway coined the phrase "alternative facts" to describe false statements made by White House secretary Sean Spicer on the size of the crowd at President Donald Trump's inauguration. Commentators compared the term to "Newspeak," the euphemistic language that the tyrannical government in "1984" used to brainwash civilians into accepting contradictory versions of the truth as simultaneously accurate. Brooklyn Public Library cardholders had checked out all 71 of the system's English-language copies and placed 43 holds on them as of Thursday evening, library spokesman Adam Leddy said. They had also borrowed the audiobook and e-book versions of Orwell's classic text. "While demand hasn’t yet risen to the point that we would order more, it’s something that we’re keeping an eye on," Leddy said. Queens Library patrons had placed 15 holds on the system's more than 400 copies as of Thursday evening, compared to five last week, library spokeswoman Elisabeth de Bourbon reported in an email. As for the New York Public Library, which has branches in Manhattan, Staten Island and The Bronx, the waitlist for the system's 326 English-language copies is 37 holds deep, according to spokeswoman Angela Montefinise. This is after the library placed orders for 24 new books over the past few months. Cardholders have also placed six holds on the system's 40 Spanish-language copies and 107 holds on its 20 e-book editions. So what should you do if you can't get your hands on a physical copy of "1984" at a city library? NYPL librarian Lynn Lobash recommends borrowing these other dystopian novels: Margaret Atwood's "The Handmaid's Tale" ; Ray Bradbury's "Fahrenheit 451"; Emmi Itäranta's "Memory of Water"; and Jenni Fagan's "The Sunlight Pilgrims."